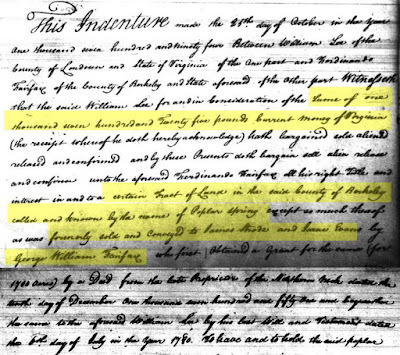 Using my fledgling geometry skills, I recently translated a bewildering 18th century land description, and platted the 100 acres in Berkeley County, (West) Virginia that the Honorable George William Fairfax leased to a farmer named Joseph Kirk - my maybe sixth great-grandfather. However, my attempts to pinpoint the property's location on a modern map hit repeated brick walls. Can You Tell Me How To Get To Joseph Kirk's? 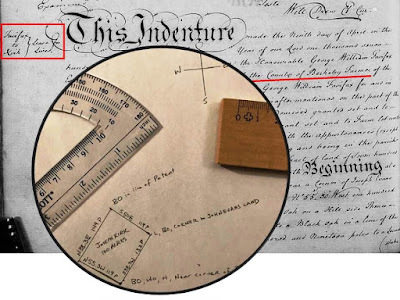 The April 1773 land lease recorded in Berkely County between George William Fairfax and Joseph Kirk detailed physical features of the farm's corners, the degree of each corner's angle, and the length of the subsequent border (measured in poles). For example, one of the corners of Joseph's leased farm began "...at a stake near a black oak, white oak, and hickory, and near a corner of Joseph Evans and Michael Close..." From that corner of the property, the border extended "...thence with Close's line N55.30W one hundred and nineteen poles between a hickory and a black oak on a hill side..."
The specificity of the degree of the angles and the length of the property line guided me in drafting a beautiful box that matched the boundaries of Joseph Kirk's farm, but it provided little that could anchor the 100 acres to a map. A member of the West Virginia Genealogy Network recommended that I "Try locating a water course in this or neighboring properties." 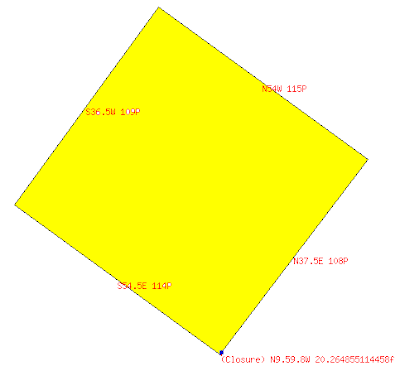 Fortunately, two of Joseph's neighbors were named in the boundary description: Joseph Evans and Michael Close. Both men had also leased land from George William Fairfax. All of these men leased acreage that was part of a larger tract of land called Poplar Spring. 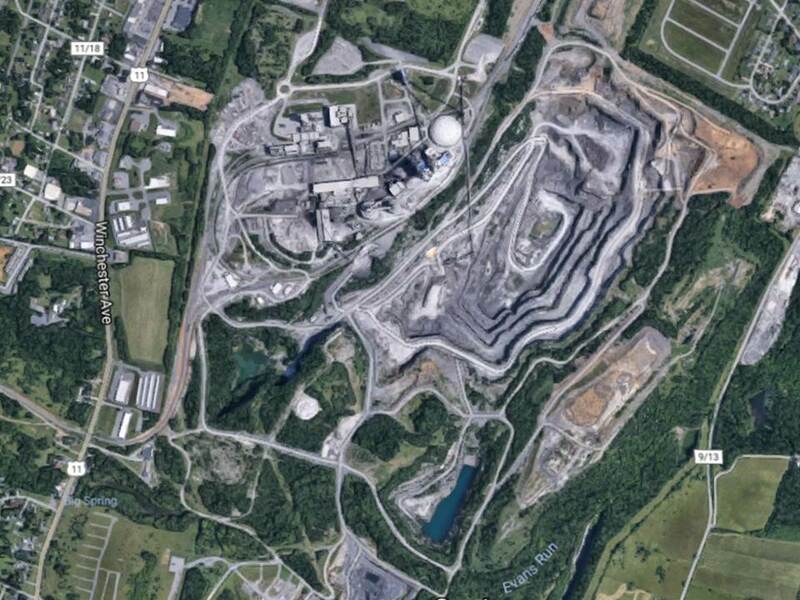 In total, the tract covered an estimated 1,700 acres in the Parish of Norborne, Berkeley County, (West) Virginia. Over the course of some very tedious hours, I identified more of Joseph's neighbors and platted 956 of the 1,700 acres. Frustratingly, there were no water courses running through any of those properties. Without any known digitized maps or surveys of the Poplar Spring tract, I turned again to Joseph's deed to see whether I overlooked any clues. 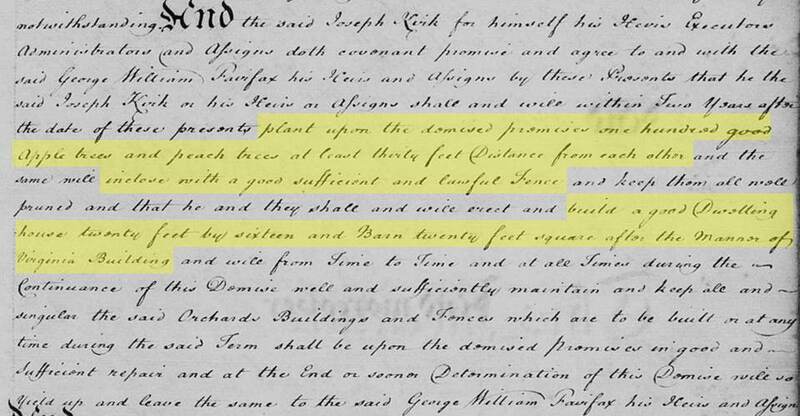 Buried in the four-page lease were some exacting requirements of Joseph Kirk (and the other men settling in Poplar Spring). Joseph was required "...within two years after the date..." of the lease to "plant upon the domised premises one hundred good apple trees and peach trees at least thirty feet distance from each other and the same will inclose with a good sufficient and lawful fence and keep them all well pruned..."
I knew that Joseph's farm produced wheat because he was required in 1781 by local authorities to provide six bushels and a half to colonial militias during the American Revolutionary War. Now I learned that Joseph's farm also included an orchard of apple and peach trees. But that wasn't all that was required of Joseph. The lease further stipulated that he had to "...erect and build a good dwelling house twenty feet by sixteen and barn twenty feet square after the manner of Virginia building..."
I was curious about the manner of Virginia building. I envisioned Jefferson's Monticello. However, on a much smaller scale. 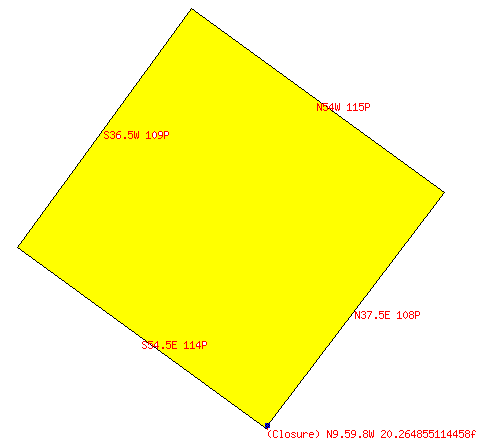 If those stipulated dimensions held true to the final structure, a 20' x 16' home was only 320 square feet. Now insert Joseph and his wife Sarah and their children. That's a tight squeeze! Key takeaway? I was looking for a plot of land that had a home, barn, orchard, wheat field, and was all enclosed with a sufficient and lawful fence. At least by 1775 anyway. Would any of those features survive today? Doubtful. 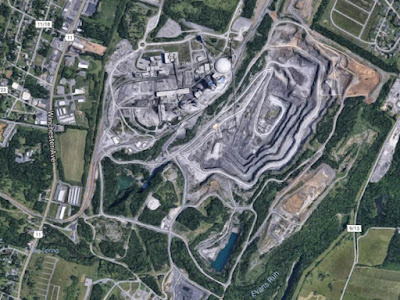 Although it might be possible to discern old boundaries with an aerial view on Google Maps. Who Got the Kirk Family Farm? What if I took a different approach and gave Joseph's 100-acre farm some genealogy treatment? 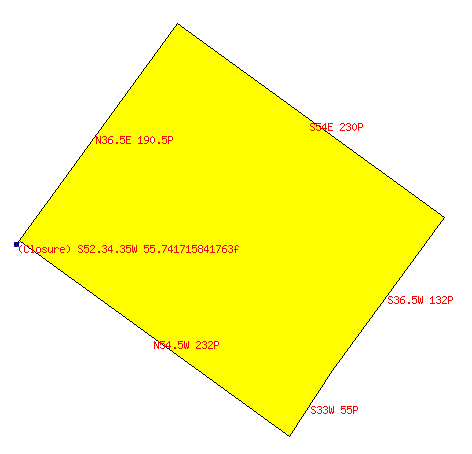 Could I trace ownership forward in time in the hopes that future land deeds would provide better coordinates that would help me identify the property on a current map? The Poplar Spring tract of 1,700 acres was undergoing changes in ownership. 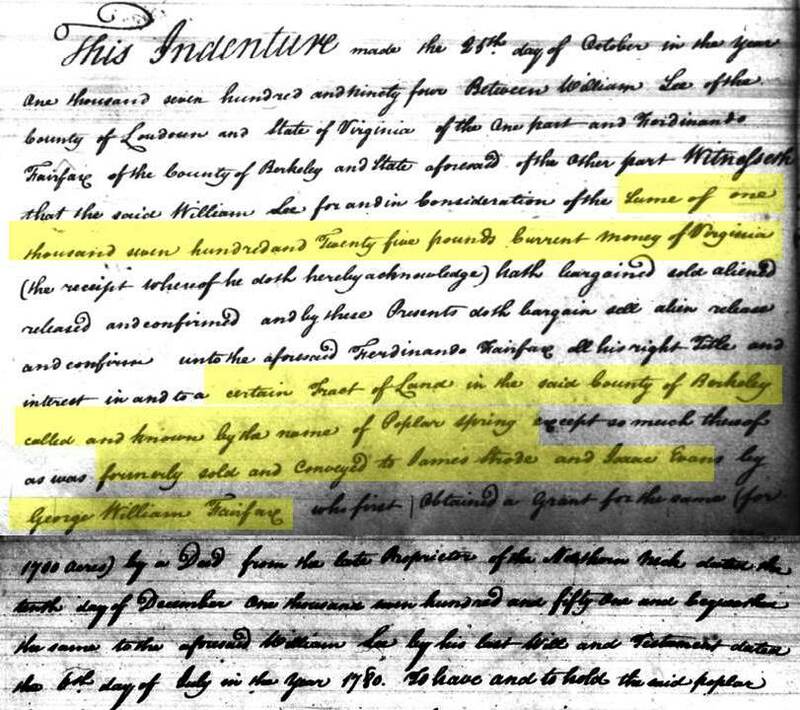 George William Fairfax, the proprietor of Virginia's Northern Neck territory who originally leased 100 acres to Joseph Kirk, had inherited the land from his predecessor by a proprietary deed dated December 10, 1751. 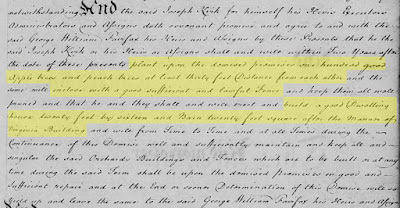 George William Fairfax in turn bequeathed the property to his nephew William Lee on July 6, 1780 in his will recorded in the general court office. 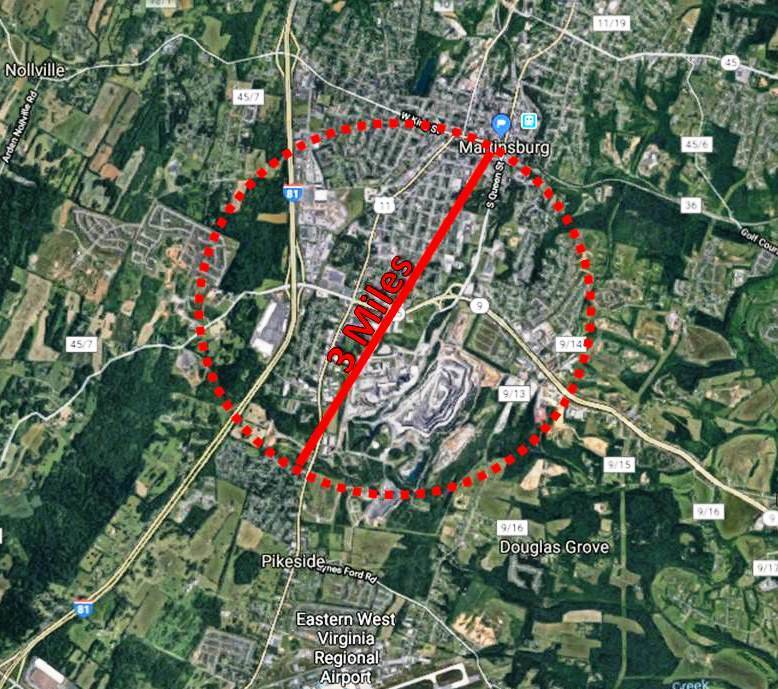 I don't currently know in which county(ies) either the deed or the will were filed, but I'm on the hunt since they may include details about the Poplar Spring tract's precise location and possibly its tenants. On October 25, 1794, William Lee sold the Poplar Spring tract to Ferdinando Fairfax, an heir to Virginia's Northern Neck Proprietary. For £1,725, Ferdinando purchased "...a certain tract of land in the said County of Berkeley called and known by the name of Poplar Spring except so much thereof as was formerly sold and conveyed to James Strode and Isaac Evans by George William Fairfax..."
During the changes of ownership, Joseph Kirk continued to lease his 100 acres until his death in about 1784. His widow, Sarah, then lived on the farm through at least April 1797. By the next year, though, things would change. 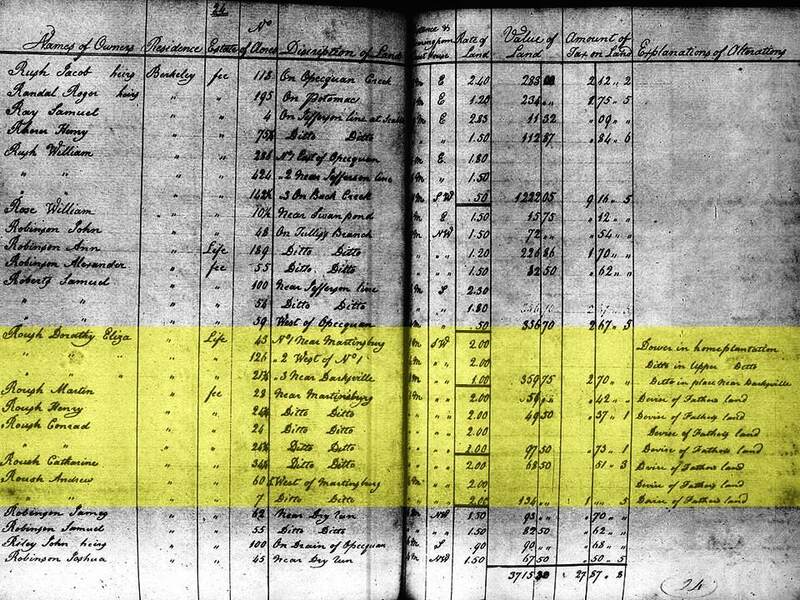 On September 7, 1798, Ferdinando sold both the Kirk and neighboring Close farms for $4,320 to Nicholas Roush. 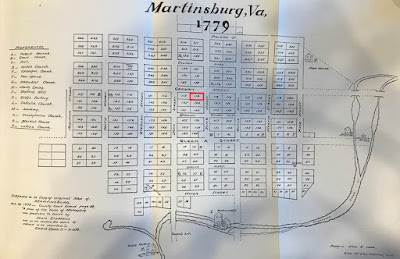 Aside from providing a new plot description of the combined farms (consisting of 270 acres), this deed provided the first solid clue about the land's location, stating that it was "...situated about three miles from the said Town of Martinsburg..."
The new boundary descriptions of the combined farms were based on "...a private survey thereof made by W. David Hunter in April 1797..." Where was this survey, which was mapped when Sarah Kirk still lived on the land? Was it entered into the court record? I have yet to find it. Using Tract Plotter (a fantastic free resource for genealogists needing to plat land), I drafted the shape of the combined Kirk and Close farms. Perhaps these new boundary measurements would be helpful in tracing the property forward in time. 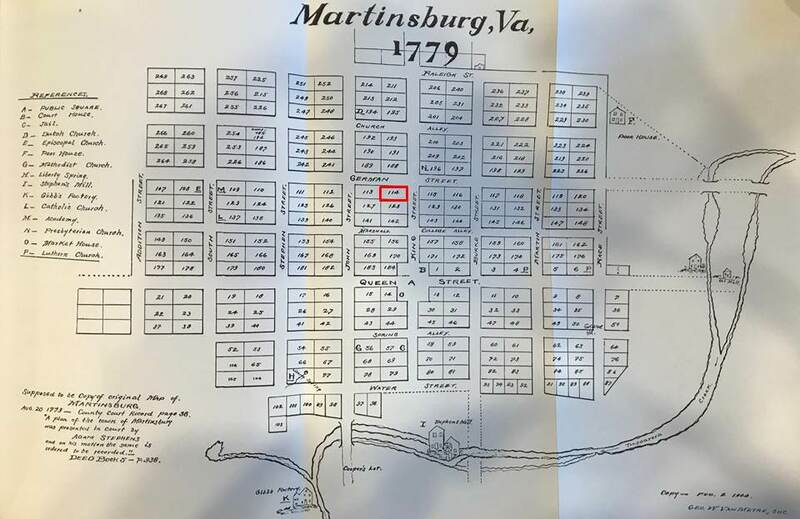 The same day that the Kirk farm was sold, Nicholas Roush turned around and sold to Ferdinando Fairfax lot 114 in the town of Martinsburg in Berkeley County for $2,000. An apparent quid pro quo that confirmed that the Kirks were off the farm and out of the picture. How long did Nicholas Roush hold on to the now combined Kirk and Close farms? When and to whom did he sell it? 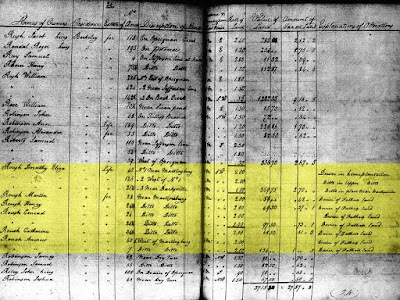 Following Nicholas Roush’s purchase of the Kirk and Close farms in 1798, he was recorded in Berkeley County as a grantor for six subsequent land transactions spanning the years 1802 to 1811. Most of the deeds of sale were for lots he owned in the town of Martinsburg. None were for the former Kirk land. 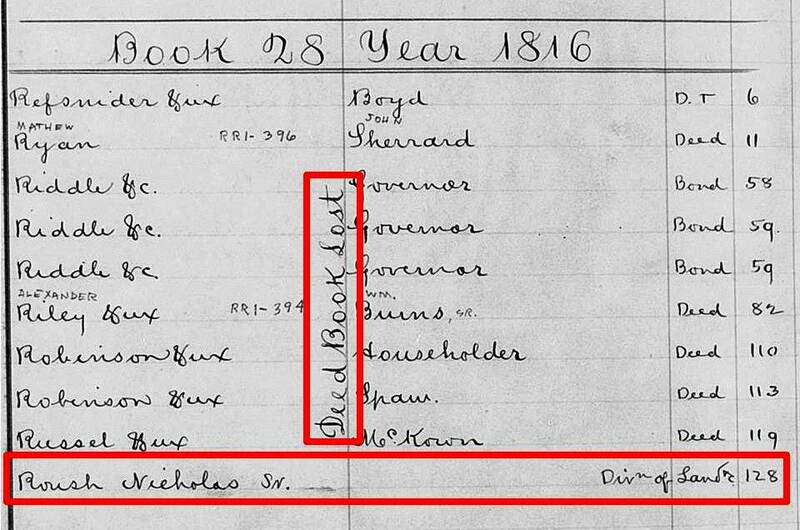 In 1816, an entry in the general index for Berkeley County's deeds recorded that there was a division of Nicholas Roush's lands. He must have died and his real estate was divided among his heirs. With no record of it having been sold since its purchase in 1798, the Kirk land was presumably still among Roush's holdings. Was it doled out to one of his heirs? To my great misfortune, the deed book for much of 1816 - number 28 - was lost! Missing from the courthouse, it had never been microfilmed or digitized. Only the index survived to taunt me. The original deed likely included detailed descriptions of the property's provenance (naming all prior owners and the dates of each subsequent acquisition), possibly more accurate wayfinding coordinates, as well as how the land was divided among the heirs and the name(s) of who inherited which parts. All of this valuable information was lost and I was no closer to finding Joseph Kirk's farm. What did my genealogy possibly lose? Maybe mention of Joseph Kirk or his widow Sarah Kirk. Maybe even the names of their heirs who lived on the farm with Sarah. I was left with a knot in my stomach. 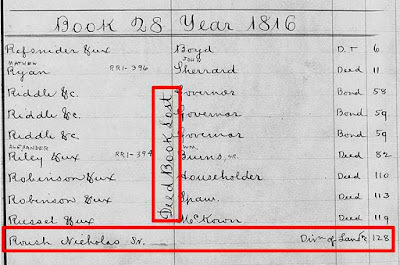 Perhaps Nicholas Roush's probate package included the details recorded in the lost deed book. Frustratingly, the Berkeley County probate files are only viewable online at FamilySearch from a designated Family History Library. As a resident of Virginia, I find the restricted access particularly galling. Where's Reclaim the Records when you need them? The question remained: who inherited the land from Nicholas Roush's estate that was once farmed by Joseph Kirk? A hint came from a deed of sale on December 31, 1816. Daniel Lyne and "Elizabeth his wife late Elizabeth Roush one of the daughters and legal heirs of Nicholas Roush Senior late of the County of Berkeley and State of Virginia..." were selling land to Andrew Roush, presumably Elizabeth's brother. The deed shed light on the division of Nicholas' lands. The property that the Lynes were selling was "...part of the land held by the said Nicholas Roush senior at his death the court of the county of Berkeley having appointed John Fryatt, George Porterfield, Peter Grove, George Harris, and James Maxwell commissioners to divide the lands held by the said Nicholas Roush senior at his death among his heirs and pursuant to the order of the court aforesaid did on the 11th day of April 1816 as appears by their report made a division of the lands aforesaid amongst the heirs..."
In total, Andrew Roush bought 77 acres and two rods from Elizabeth (Roush) Lyne. Fewer than the more than 207 acres that made up the combined Close and Kirk farms. But the measurements of the property being sold were strikingly similar. After reviewing dozens of deeds, it was clear that the Roush heirs inherited - and in turn sold - fractions of once larger plots of land. The properties had been divided up beyond recognition with new angles and lengths of measurement. Finding boundary descriptions that mirrored the Kirk and Close farms was a gargantuan task. Efforts to find deeds were further confounded by several missing deed books, including Book 37 covering the years 1827 - 1829, Book 38 covering the years 1829 - 1830, and Book 42 covering the years 1837 - 1838. In all three books, the surviving index detailed a total of eight transactions where a Roush heir was selling property. Was it land that was inherited from Nicholas Roush Sr. and once the farm of Joseph Kirk? I couldn't say, and the knot in my stomach tightened. Many of Berkeley County's deed books do survive and are available online. Nicholas Roush's heirs are party to many deeds, including his widow Dorothy and at least five sons (Nicholas Jr, Martin, Andrew, Henry, and Conrad) and three daughters (Elizabeth Line, Catherine Faris, and Rosanna Young). Would any of these deeds share a land description with the one-time Kirk property? In short, maybe. But the time required to piece the divided land together likely outweighed the value of investing research time in finding Nicholas Roush's probate package. I returned to the deed between Ferdinando Fairfax and Nicholas Roush, which suggested the Close and Kirk farms were about three miles from Martinsburg. I scrutinized Google maps trying to visualize a three-mile radius around Martinsburg. To my shagrin, a vast open-pit mine edged into my targeted research zone. Like a metaphor for my Kirk ancestry, was I searching for something that had disappeared into a cavernous void? Or maybe W. David Hunter's April 1797 land survey of the Poplar Spring tract was recorded in Berkeley County's Courthouse. Despite the setbacks and waves of despair, I continue climbing further into the Kirk research rabbit hole. There's no turning back now. Wow! I'm blown away by the amount of time and effort you put into this. Wonderful post. You've got a plan and I'm rooting for you, Michael. Thank you, Cathy. Although I've learned a lot following this research path, I've had several moments where I was really frustrated because I couldn't catch a break. Lost deed books, really? As if all the destroyed census enumerations and burned courthouse records I've suffered with my Ohio-based Kirk research wasn't enough. The joy and agony of it all... Here's hoping one of my research avenues pays off. Terrific work! I learned that books not filmed are usually still at the county courthouse. They are too battered or the writing is too faint for microfilming. But if you go in person you can transcribe or digitally photograph. I called first to confirm the missing books did exist. That's encouraging to hear, Schalene. I am planning to visit Berkeley County's courthouse in the coming weeks. Once again, I am just amazed by your perseverance! As for the materials viewable only at a FHC, I feel your pain as I live too far from an FHC to make it feasible for going to see just one document. But maybe someone else who lives closer to one could help you? 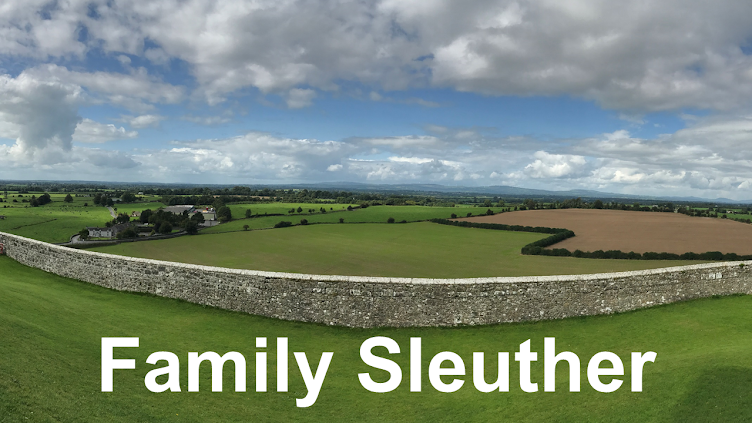 Maybe someone in the Genealogy Bloggers group or another FB group to which you belong? Hang in there! You are SO close! I'm hanging in...albeit by a thread! ;) A challenge with most of these records collections is that they're not indexed, so it's often a time-intensive search that's best done from the comfort of home where I can search into the wee hours. Harder to do - or ask someone to do - from a FHC with their restrictive hours. But I am making progress! I landed on George William Fairfax's will (this copy was filed in Bath, England). It provides a single additional wayfinding clue in that the Poplar Spring tract was near the Opequon River. Little by little! But sounds like you are getting closer! Keep us posted!